Serenbe Photography Center Collectors' Guild was pleased to present John Bennette on February 24. Mr. Bennette spoke passionately on collecting photography -- telling of some of his personal pieces and the acquisition of them. 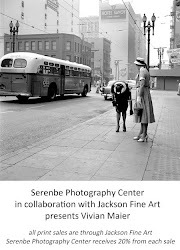 He also gave much insight to the phenomena of Vivian Maier. John Bennette, Alabama native, now of New York City, is the former Discovery Editor at 21st The Journal of Contemporary Photography. He lectures, curates, and writes about photography and collecting. Mr. Bennette has a popular blog that is read by many. He has juried various photo competitions includine "A.I.R. 2003" at Woodstock Center for Photography and SlowExposures. In November 2002, a 16-page feature about Mr. Bennette's collection and his thoughts on the photo world as he sees it was published under the title, How One Man's Passion Is Changing The Way We Collect in Art & Auction magazine's "Focus on Photography."